Goffs Park is the new venue for Crawley Ice Rink. And Tilgate Park’s Magical Christmas takes place in the Walled Garden at Tilgate Park every Friday, Saturday and Sunday from November 30 - December 23. Councillor Chris Mullins said: “Tilgate Park’s Magical Christmas and Crawley Ice Rink will bring a special festive atmosphere to the town this year. Entry to Tilgate Park’s Magical Christmas is free but some attractions have a fee. Opening times are noon-8pm on Fridays, 10am-8pm on Saturdays and 10am-6pm on Sundays. * Live entertainment at various times. A council spokesman said: “This year will feature a magical Santa’s Grotto with an elf workshop experience. First you get to meet Santa Claus himself in his grotto where he will give each child a golden ticket which grants them entry into the elf workshop next door. The ice rink is open every day until Sunday January 20 except Christmas Day. It is bigger than the rink in Queens Square last Christmas and has an Alpine-themed café. It is suitable for anyone over the age of four. All skating sessions last for one hour. The first session begins at 10am at weekends and every day between December 15 and January 6. At all other times the first session begins at 12.30pm. The last session begins at 8pm every day except for New Year’s Eve, when the last session will be at 5.30pm. Peak sessions cost £9.75 for adults and £8 for children aged 16 and under. There are several ways to travel to and from Crawley Ice Rink in Goffs Park. Goffs Park is only a 10-minute walk from Crawley Train Station and Crawley Bus Station. Orchard Street multi-storey and surface car parks in the town centre are less than a 10-minute walk away from the ice rink. 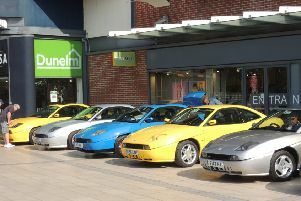 Several other town centre car parks are also available. Visit crawley.gov.uk/parking for more details. Limited car parking (40 spaces) is available in the Goffs Park car park, accessible from Horsham Road. Overflow car parking (100 spaces) is available at St Wilfrid’s School on Sundays. Please do not park on Horsham Road.